The design of this demining hand tool is based on the rules required to ensure that a tool does not separate or fragment in an anti-personnel mine blast. Thousands are in use in Humanitarian Demining around the world. The pick-prod is designed as a prodder and a scraper for use when working in hard ground. It is used to break up the ground and to keep the user’s hand low in the event of a detonation. Quote the SD Order No. SKU3011. Made from “T” section mild steel (a cross-section through the blade is shown alongside), the Pick-Prod blade is a 31cm long in-line prod that can be used to pick at the ground with considerable force without the blade bending. 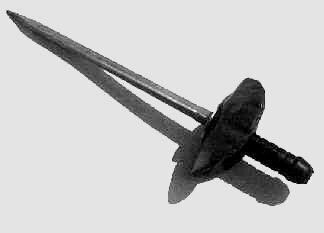 In softer ground, a twisting movement breaks up the ground more efficiently than a bayonet. The T section allows loosened spoil to be scraped aside. The user’s hand is protected by a washable and pliable aramid blast-shield in front of a comfortable 14cm long handle. The “T” section tapers to a point and is a compromise between allowing penetration and ensuring that the tool is strong enough not to be damaged in normal use. Although the tool can be used as a scraper, It is intended that ground broken with this tool would then be removed with another tool. The metal parts are hard-chromed to prevent rust. The handle is made of non-shattering polyethylene which has performed excellently in all test and real blast situations. The tool weighs around 0.5Kg (1.2 lbs). The picture on the right shows pick-prods after detonating a 200g mine while excavating. In every case, the tool remained intact and the blade curved. Open PDF data-sheet about using the SD Pick-prod.